Claire Rutter, soprano. Ladies of the RSNO Chorus. Notes in English and Deutsch. Text of Op. 18 in English. When I first discovered classical music, the recording of The Planets was by Malcolm Sargent. I still remember moments of pure, clear beauty from that long gone disk that seem never to have been recaptured, but I�m probably just indulging in nostalgic fantasy. Nowadays everybody does The Planets, and I expect the next recordings we hear will be from Nikolaus Harnoncourt, Valery Gergiev, René Clemencic, Pierre Boulez, and Reinhard Goebel. Karajan, who recorded almost no British music, recorded The Planets twice. Patrick Gleeson�s synthesizer version should be ready for re-release on CD soon now. 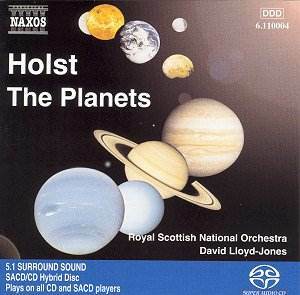 This performance of The Planets by Lloyd-Jones, the second recording from the Scottish National Orchestra, is quite good, but at those critical moments when we hope for genius, we get competence instead. The sound engineers have let everybody down. On the SACD surround sound tracks the delicate harp and percussion accents are all but inaudible. Neptune is too fast and (like the Bernstein recording) too loud; the chorus is in the back of the hall, but they sound as if their acoustic has been electronically altered. There is nothing on this disk below about 90 Hz, so the all important organ and bass drum accents are weak and tend to boom. The upper mid range is "bright" and a little congested. I obtained the best sound on The Planets playing the two track SACD version through my Dolby digital surround decoder. The orchestra has better focus � instruments are more distinct and don�t drift around the room � the bass and highs are less congested and the chorus sounds cleaner and more realistic and is still placed at rear center. The fadeout on the chorus is one of the very best I�ve heard. All this leads me to conjecture that the 2 channel and surround SACD versions are possibly separate recordings using different microphones. If you want The Planets in high definition sound, by all means buy the EMI DVD-Audio disk while you can. You�ll never be sorry, for no matter who else records The Planets the Previn performance will always be exceptionally worthwhile. If you don�t have SACD or DVD-Audio and want a good Planets, buy the Decca disk; at the price you couldn�t do better. The Mystic Trumpeter, to a text by Walt Whitman, was written in 1904 and revised in 1912, but lay unpublished until 1979, and is the second work by Holst to evidence his admiration for the American poet, the first having been the Overture: Walt Whitman of 1899. Claire Rutter has a magnificent voice � clear, expressive � is passionately inspired, and inspires those who accompany her. Even the sound engineers do much better work on this selection, or perhaps it is just that the sparer orchestration in this work better suits the acoustics of the hall. Here the SACD surround version is far and away the best, with the voice distinct throughout the orchestral climaxes. When Claire Rutter does Elgar�s Sea Pictures, or the Götterdämmerung Brünnhilde, I want to be there. Perhaps I am just too British at heart to appreciate Whitman. I have a similar reaction to Whitman that I have to jazz, that is to say, every now and then it grabs me, but just for a moment. There is more to freedom than merely forsaking discipline. No question Whitman was a genius, for his highs are very high indeed, but what a pity he didn�t encounter Alexander Pope at an impressionable age. Buy this disk for The Trumpeter; you�ll never be sorry, for no one will ever do it any better. not recall any EMI label issuing it at that time.